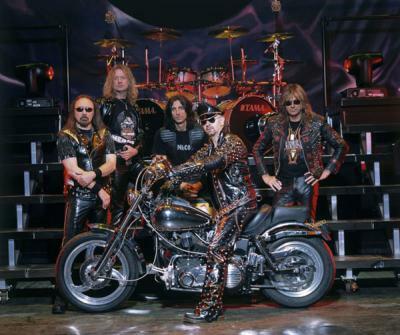 Judas Priest, formed in 1969 in Birmingham, England. One of the originators of heavy metal and the godfathers of speed metal, with Rob Halford's lead vocals notable for their high-pitched screams, they also feature an innovative two-lead-guitar sound and are particularly noted for their complex guitar duets courtesy of K.K. Downing and Glenn Tipton. Rob Halford left the band in the 1990s and was replaced by Tim 'Ripper' Owens, who was plucked from obscurity having previously sung in a 'Priest tribute band. Rumours are that Halford's departure constituted the basis of the film Rock Star. Judas Priest have released eighteen albums to date, the first being "Rocka Rolla" in 1974 and the latest being "Demolition" in 2001. To the delight of their shrinking fan base however, and after more than twelve years apart, Judas Priest and original lead vocalist Rob Halford annunced in July 2003 that they were reunited, with a "global" live concert tour planned for 2004. Judas Priest and Ripper Owens parted amicably by mutual agreement. In 1990 the band were involved in a civil action that alleged they were responsible for the suicide attempts of two Nevada boys (James Vance and Ray Belknap). The prosecution alleged a subliminal message to "Do It" has been included in the song "Better by You Better Than Me" (from the Stained Class album) which triggered the suicide attempt. The band were eventually acquitted. In a television interview, they commented that if they wanted to insert subliminal commands in their music, killing their fans would be counterproductive, and they would prefer to insert the command "Buy more of our records." bon coninuation de ton blog !!! z te souhaite une bnn continaution!